Celebrate Fathers Day at the British Motor Museum with plenty of gift ideas! 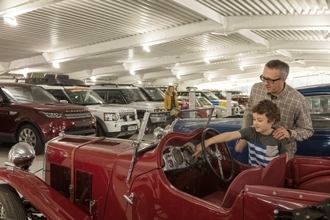 The British Motor Museum has everything all wrapped up for Father's Day whether it's a special day out or a unique gift. Treat Dad to a day out at the Museum admiring over 300 British classic cars, or sign him up to one of the motoring related autumn workshops. Topics vary from classic car maintenance to sketching and photography. Workshops and Museum tickets can be bought online at http://www.britishmotormuseum.co.uk or contact the Gift Shop on 01926 646391 if you would like a pre-paid Museum ticket posted to you for a gift. The Museum is also offering a 10% discount off their Heritage Certificates. A Heritage Certificate is an official 'Certified Copy of a Factory Record' for a classic car showing the car's specification as it left the production line. The details are taken from the original production records created by many of the leading British motor manufacturers. They can be personalised to include a picture of your own classic and are useful when applying for tax exemption - it's an ideal gift for an owner of a cherished classic car. For more details on the Heritage Certificates including a full list and date range of cars that can be provided visit britishmotormuseum.co.uk and click on Heritage Certificates. Please use the discount code FD10 at the checkout. The closing date for this offer is Sunday 20 May so that the Certificates can be prepared in time for delivery by Saturday 16 June, ready for Fathers Day on 17 June. The Museum's online shop also stocks a range of motoring gifts from DVDs featuring marque specific archive footage including Triumph, Austin Healey, BMC, Mini and many more - to car models and novelty motoring themed items. If pictures are a more suitable gift then choose from thousands of British Motor Industry Heritage Trust archive photos using the online picture library - Motorgraphs http://www.motorgraphs.com. Available as a framed print, canvas or collage, you will find a wide variety of attractive historical images featuring famous marques such as Austin Healey, Triumph, MG, Rover, Land Rover, Austin, Morris, Riley and Wolseley. There are also attractive advertising posters and colourful scenic pictures from the 1950s to the 1980s, just the thing for that difficult-to-buy-for Father or Grandfather! To find out more about the British Motor Museum and its Father's Day gift ideas please visit http://www.britishmotormuseum.co.uk or call 01926 641188.